I am pleased to be able to promote this new book by Chris Larsen, which will no doubt be one of those books that will be an invaluable aid to those interested in church history since the restoration of the hierarchy. This essential reference catalogues the biographical history and significant events of all Roman Catholic diocesan bishops who have been in office since the Restoration of the Catholic Hierarchy in England and Wales in 1850, and in Scotland since the Restoration in 1878. The work has developed over a number of years into a comprehensive reference guide to over 300 men, ordained in the episcopal order, who have given their life in service to the Church. Drawing on a wide variety of sources, this book will appeal to all those interested in the general history and origins of the post-Restoration Roman Catholic dioceses in Great Britain, and be of particular use to diocesan archivists and yearbook editors. It presents the information as completely, concisely and consistently as possible. As this book records the episcopal milestones of the last two hundred years, it also stands as a respectful testament to those bishops who have gone before us marked with the sign of faith, who continue to inspire and encourage their living successors in the Roman Catholic Church in Great Britain today. Chris Larsen was born in Croydon in 1977 and attended the John Fisher School, Purley before graduating from UWE, Bristol in 1999. For a few years, he tried a vocation to the priesthood at the Royal English College of St Alban at Valladolid in Spain and it was during this time that an interest in the diocesan history of Great Britain and its various bishops began to emerge. Since then, he has maintained a record of episcopal appointments, which has now developed into a valuable reference resource. Following his return to the UK, Chris settled in Bristol. He still enjoys to travel and has now visited every Roman Catholic cathedral around the country. We have managed to sustain a sung Mass at Buckley (First Saturday) and Holywell (Fourth Sunday) for a number of years. The cantors have made the journey to North Wales, primarily from the Wirral and have remained faithful to the original post Summorum Pontificum Masses in this diocese despite more convenient venues being available closer to home. I wish record my sincere thanks for their help and loyalty to the Latin Mass Society in Wrexham. Of course, personal circumstances change and Schola numbers have now become diminished to the extent that the chant cannot be sustained. The Masses at Holywell and Buckley will continue for as long as Father Doyle is able to celebrate them, but they will now be Low Masses. Unless of course ........ we can increase the available numbers! If you are interested in Gregorian chant and live locally and are willing to get involved, Let me know! simply e-mail me by clicking here. Jesus casts out an unclean spirit. Whereupon a woman, lifting her voice cries: Blessed is the womb that bore Thee. Dom Mark celebrated a High Mass for the LMS at Wrexham Cathedral last Summer. It is a curious fact of liturgical history that originally this Second Sunday of Lent had no Mass of its own. The Roman clergy and people were tired from the long night vigil that began on the evening of Ember Saturday and ended at dawn with the Holy Sacrifice. Only when the solemn night vigil was pushed back to Saturday morning did it become necessary to put together a separate Mass for Sunday morning. But what a Mass it is! From beginning to end today’s Mass bathes in the radiant light of the transfigured Christ. The Introit is, in many places, the same one sung on August 6th, the summer festival of the Transfiguration: “Of you my heart has spoken: 'Seek His Face.’ It is your Face, O Lord, that I seek; hide not your Face from me” (Ps 26:8-9). The Church sings of what she holds deep in her heart: the desire to gaze upon the Face of Christ. The melody itself rises and lingers over the words vultum tuum, your Face. The Introit ends in a plea, at once humble and confident: “Turn not away your Face from me” (Ps 26:9). The Church, in every age and in all her children, is called to fulfill the command addressed to Abram: “Go forth out of thy country, and from thy kindred, and out of thy father’s house, and come into the land which I shall shew thee” (Gen 12:1). The Church knows that so long as the Face of her Lord shines before her she can follow Him even along the way of the cross. He who says, “I am the way” (Jn 14:6), was lifted up on the cross, becoming the signpost pointing to “what no eye has seen, nor ear heard, nor the heart of man conceived, what God has prepared for those who love Him” (1 Cor 2:9). Relentlessly God calls us out of what is familiar, out of our routines (even our pious ones) into the uncharted vastness of faith, “into the land that He will show us” (Gen 12:1). In the Church’s choice of today’s Introit there is a very practical teaching for our own Lenten journey. We are to focus not on our sins, nor on our weaknesses, nor on the roughness of the path beneath our feet, but on the Face of Christ. The Introit wonderfully anticipates the words of Saint Matthew in the gospel: “And they lifting up their eyes saw no one but only Jesus” (Mt 17:8). The psalm that accompanies the Introit describes the fear of one threatened by attackers on all sides. Psalm 26 is the prayer of one thrust into the fray of spiritual combat. And yet, it teaches us to say, even in the midst of the battle: “The Lord is my light and my salvation, whom shall I fear? The Lord is the protector of my life: of whom shall I be afraid” (Ps 26:1). Again, note the link between the introit and the gospel. “And Jesus came and touched them: and said to them, 'Arise and fear not’” (Mt 17:7). Looking into the eyes of her Saviour, the Church says in the words of the psalmist, “Of whom shall I be afraid?” (Ps 26:1). This Sunday of the Transfiguration follows the Sunday of the Temptation. This too is full of meaning and of practical teaching for us. Saint Paul addresses Timothy with a stern realism: “Bear your share of hardship for the gospel with the strength that comes from God” (2 Tim 1:8). The beginning of the way of the cross is beset with hardship, with temptations. Holy Father Benedict knew this well. He speaks of all the things that are hard and repugnant in the way to God” (RB 8:8). The return to God is through “the toil of obedience” (RB Pro: 2), the hard listening that changes life. There is no return to God apart from the way of the cross, and there is no other way to glory. The ultimate tragedy is our refusal to follow Christ ad gloriam, to glory (RB Pro: 7). The Collect reminds us that without the sustenance of God’s word we will suffer spiritual malnutrition, grow weak, and falter. This is why the Church has us pray: O God, who commanded us to listen to your Son, the Beloved, deign to feed us inwardly by your word.” The soul who, engaged in spiritual combat, slacks off in the practice of lectio divina or allows herself to become indifferent to it, will become spiritually anemic. The soul “inwardly fed by the Word of God” will enjoy a growing clarity of vision. Seeing more clearly, she will be able to follow Christ more closely. Strengthened inwardly, she will be able to walk more securely, until, as the Collect says, “with the eyes of the heart made pure,” she rejoices at the sight of the glory of God. Today, the Offertory Antiphon is the voice of the Church reflecting on everything spoken to her in the Liturgy of the Word. The command of the Father speaking out of the bright cloud calls for a response. “This is my beloved Son, in whom I am well pleased: listen to Him” (Mt 17:5). While the bread and wine are made ready she takes a moment to ponder what has been said to her, and she makes a resolution. What does she resolve to do? “I will meditate on your commands which I love exceedingly; with arms flung wide I will stretch toward your commandments for I love them” (Ps 118:47-48). The antiphon is taken from Psalm 118 wherein every reference to the commandments, the law, the statutes of God become, for the Church, a reference to Christ, the beloved Son. The Church resolves today to “set nothing before the love of Christ” (RB 4:21). She addresses the Father who spoke to her in the Gospel, and moved by the Spirit, makes this bold resolution. The melody itself is full of energy and tenderness. “I will meditate on your Christ whom I love exceedingly; with arms flung wide I will stretch toward Christ for I love Him.” It is this prayer that readies us for the Holy Sacrifice. We cannot step into the sacrosanct core of the Mass without encountering the love of Christ, without coming face to face with “the love of God which, being perfect, drives out all fear” (RB Pro: 67). Every fear, every terror “melts like wax before Him” (cf. Ps 67:3) whose “Face shines like the sun” (Mt 17:2). Exposure to the brightness of the Eucharist, -- a brightness veiled beneath the appearances of bread and wine -- is exposure to the love of Christ and to the radiance of His Face. After Holy Communion, made aware of this we will pray to the Father, saying that, “while we are yet on earth He gives us to partake of things of heaven.” What are these things? The book of the Apocalypse tells us what they are: “And they shall see His Face: and His name shall be on their foreheads. And night shall be no more and they shall not need the light of the lamp, nor the light of the sun, because the Lord God shall enlighten them, and shall reign forever and ever” (Ap 22:4-5). With the Face of Christ before us and His light surrounding us we can go forward, even into the dark uncharted territories of faith. “The Lord is my light and my salvation, whom shall I fear?” (Ps 26:1). Mass of the Holy Face of Jesus, at St Catherine Laboure, Stanifield Lane, Farington on Tuesday at 12 noon. Father de Malleray FSSP over at St Mary's in Warrington has provided details of the programme of events appertaining to the visit of Bishop Athanasius Schneider later this month. 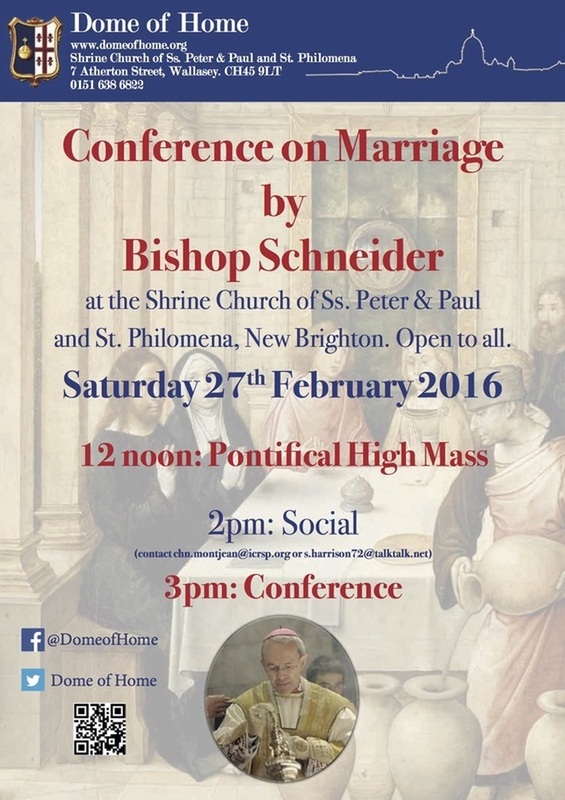 Additionally, Bishop Schneider will be at Ss Peter and Paul and St Philomena, New Brighton on Saturday 27th February - details of his visit there can be viewed here. 7:00PM: Spiritual Talk to clergy: "The priest as a minister of the truth"
1:00pm Spiritual talk to all: "The Christian faith and martyrdom"
Bishop Athanasius Schneider was born in Tokmok, Kirghiz SSR in the Soviet Union. His parents were ethnic Germans from Ukraine who were sent by Stalin to gulags in the Ural Mountains after the Second World War. They traveled to the Kirghiz SSR after being released from the camps. In 1973, shortly after making his first Holy Communion by the hand of Bl. Oleksa Zaryckyj, priest and martyr, he left with his family for Germany. He joined the Canons Regular of the Holy Cross of Coimbra, a Catholic religious order, and was ordained a priest in 1990, earning a doctorate in Patristics, a topic he taught at Mary Mother of the Church Seminary in Karaganda. On 2 June 2006 he was consecrated Bishop at the Altar of the Chair of Saint Peter in the Vatican by Angelo Cardinal Sodano. In 2011 he was transferred to the position of auxiliary bishop in the Archdiocese of Astana. He is the Secretary of the Bishops' Conference of Kazakhstan. In Karaganda, formerly the centre of Soviet atheistic persecution, he managed to build a superb landmark Catholic cathedral. Bishop Schneider speaks many languages and is regularly invited to give conferences on faith and morals to clergy and lay people at international Catholic events.